Industrial metals for the most part fell in April, but that wasn’t the case for aluminum. The lightweight metal outperformed its peers as aluminum is expected to be the next target of supply-side reform in China, according to Goldman Sachs. While China tries to transition from a manufacturing economy to a service-driven one, it is aiming to cut industrial overcapacity due to environmental problems. China previously indicated its strong intentions to implement supply-side reforms in the steel industry. As a result, steel prices in China rose by 70% in less than a year. China’s energy intensive aluminum smelters receive nearly 90% of their energy needs from coal. In addition, China has received a lot of international pressure to reduce its aluminum capacity. For these reasons, aluminum could be the new steel this year. To start, China announced in late February that it would cut as much as 30% of its aluminum production over the winter months. As my colleague Stuart Burns put it, “Beijing has shown solid intent in this direction, already denying planning approval to 2 million tons of new capacity in China’s northwest province of Xinjiang and clamping down hard on plants elsewhere that it deems to be failing environmental standards.” In addition, industry watchers believe that this might just be the beginning as more closures are expected to come in heavily industrialized provinces. 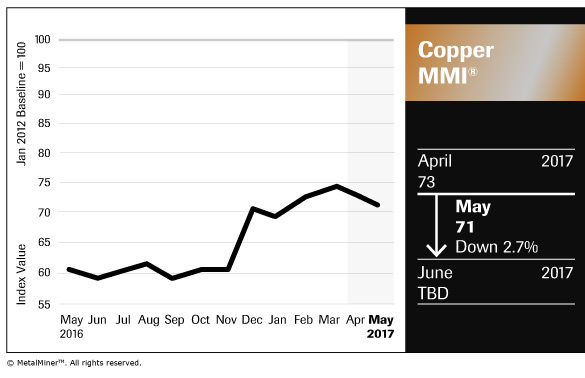 Our Copper MMI fell by two points in April, dragged down by a sell-off in industrial metals. In addition, supply concerns have eased as strikes at some mines ended. The strike at Escondida in Chile, the world’s largest copper mine, ended in late March. Soon after, a 18-day strike at the Cerro Verde mine in Peru also came to an end. A new strike at the mining company Southern Copper Corp. in Peru took place in April, but it lasted only two weeks, leaving no significant effect on production. Meanwhile, Freeport McMoRan finally obtained a permit to export material from its Grasberg mine, the second largest copper mine in the world. The new permit will allow the company to export 1.1 million tons of copper concentrate through February of next year. However, Freeport now has a new problem on its hands. Workers have threatened a one-month strike starting in May. The company had laid off about 10% of its workers, saying that there may be more layoffs in the future to stem losses. Moreover, the company is still confronting Indonesia over rights to the mine. With this problematic combination of protests from workers and tensions with the Indonesian government, it’s no wonder that investors are concerned about further supply disruptions this year. Although supply disruptions eased in March and April, there is overall plenty of potential for further disruptions this year. Prices took a dip in April, but that seems to be a normal price action given that most industrial metals fell in the same month. After a spectacular rally in Q4 of last year, prices are now consolidating in the price range of $5,500-$6,100/mt. Bulls seems still in control but they probably need another bullish development to chase prices above this price range. That development could come in the for of additional supply disruptions this year. We will be watching closely the developments at the Grasberg mine in the coming week in addition to the several mines that have contract negotiations due to this year. Raw Steels MMI Falls: How Will Steel Prices Look in the Next Two Months? Our Raw Steels MMI fell seven points* due to the slump in China’s steel prices in April. Since their peak in February, China’s steel prices have fallen by more than 20%, while U.S. prices have continued to climb. But guess what, things changed towards the end of April. Prices in China started to recover (see how we predicted that) while U.S. prices fell (yes, we predicted that too). In this post, I’ll analyze what this price divergence means and how you — assuming you buy or invest in steel — can take advantage of it. Industrial Metals Bull Market: Is There Still an Upside? Industrial metals have been on a tear since we called a bull market just about a year ago. However, we have recently witnessed some price weakness over the past couple of months. Commodities like industrial metals are cyclical assets which tend to run in the same direction for long periods of time. The key is to recognize the peaks and valleys of the cycle to time your purchases accordingly. The industrial metals ETF: peak or pause? Source: MetalMiner analysis of @stockcharts.com data. The ongoing bull market in industrial metals has run for over a year and while some metals are experiencing some setbacks, it’s a good time to bring up the question: Are we nearing a peak or this is just a pause before prices break on the upside? As we all know, China is the world’s largest producer and consumer of industrial metals. Any changes on China’s supply and demand equation can have a huge impact on the price of metals. The performance of Chinese stock markets are a great gauge of investors’ sentiment on China’s economy. Since China became a major economy, we’ve seen a strong correlation between Chinese markets and metal prices. Chinese stock market etf trading near highs. Source: MetalMiner analysis of @stockcharts.com data. Price momentum in Chinese markets has indeed picked up this year, tradin near a two year-high. The latest economic indicators continue to increase investors’ confidence in China. China’s GDP came at 6.9% in the first quarter, the fastest pace in almost two years, up from a 6.8% growth in the previous quarter and putting the country well ahead of its goal of 6.5% annual GDP. Chinese investment in buildings, factories and other fixed assets rose 9.2% for the first quarter while construction starts surged by 11.6%. If that’s not enough, in April, China’s government announced plans to build a new megacity, which will increase the demand for steel and other industrial metals. This growth translates into solid demand for industrial metals at the same time that China applies stricter anti-pollution rules and supply-side reforms designed to cut capacity in energy-intensive sectors like steel and aluminum. Overall, while we continue to see strength in Chinese markets, we are not ready to call peak in this industrial metals bull market. Base metals are commodities and, as such, move in opposite directions to the dollar. Over the past 20 years, every major bottom in commodities have coincided with a major peak in the U.S. dollar and vice versa. For a continuation of a bull market in industrial metals we should see weakness in the dollar. This year we have seen that. The U.S. dollar index falls to a 5-month-low. Source: MetalMiner analysis of @stockcharts.com data. According to the Wall Street Journal, on Monday, “the dollar fell to a five-month low due to a surge in the euro after the first round of the French presidential election eased concerns about the future of the European currency.” The notion is that the Euro would likely strengthen if Macron wins the election. If centrist candidate Emmanuel Macron gets elected in the final round (May 7), markets might start to focus on a positive European economic picture and its higher growth relative to the U.S. That could potentially devalue the dollar against the euro, a bullish development for industrial metal prices. Industrial buyers need to watch closely for signs of a market top. For now, the recent price weakness in industrial metals seems normal in the context of a bull market and key indicators such as China and the dollar favor a continuation of this uptrend. Industrial buyers should continue to manage their commodity price risk exposure until we see real signs of a market peak. Tin prices have rebounded since March. Prices fell sharply earlier this year but they have now found stability in Q2. As we pointed out in February, that month presented a good opportunity to buy tin. During bull markets, it’s good to time your purchases after a price pullback. Tin prices bounce off support levels. 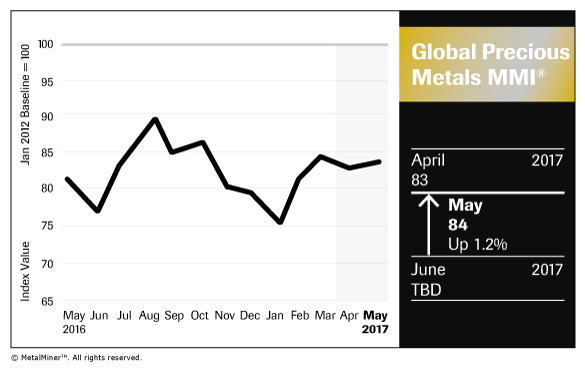 Source: MetalMiner analysis of LME data. According to the ITRI, Indonesian tin exports for 2016 fell 9.4% compared to 2015 as Indonesia tightened its rules for tin exports. However, the export permit process has been far smoother this year. For the first quarter, exports were up by 3.1% compared to the final quarter of 2016, and up 86% from the same quarter of last year. According to the International Tin Research Institute, many smelters in the country are operating on tight margins, with some understood to have temporarily halted production when prices dropped below US$19,000/mt in February before resuming when prices recovered above $20,000/mt. ITRI expects Indonesian refined shipments this year to remain broadly level with 2016. The next few months figures will give as a clearer picture on how much metal Indonesia will export this year. According to the ITRI, Myanmar was the source of over 99% of China’s reported tin ore and concentrate imports in January and February, which totaled exactly 40,000 mt, down 51% from 81,077 mt for the same period of 2016. Sales of concentrates stockpiles at the beginning of the quarter explain why shipments fell. In addition, the Chinese Spring Festival also impacted numbers. For these reasons it seems too early to tell whether exports will continue to decline or not but ITRI expects exports to be limited in 2017. Tin’s performance for the balance of 2017 will strongly depend on the production levels of these two Asian countries. For now, supply seems to be limited while most established producers are struggling to maintain production. Meanwhile, the demand outlook for the whole industrial metals pack looks stronger than expected, which should provide a floor to prices this year. Zinc prices have fallen sharply over the past two weeks. While others panic and see this decline as the end of zinc’s bull run, I see this price pullback as a great opportunity to purchase the metal at a good price. The 3-month LME zinc price. Source: MetalMiner analysis of LME data. After doubling in price since the beginning of 2016, prices are now struggling in the $3,000 per metric ton level. However, the price weakness seems to come from long position buyers exiting those positions rather than shorts coming to the market. This suggests that sentiment hasn’t shifted to bearish for now. At the same time, we see strong support near $2,500/mt, which could provide a good opportunity to time purchases. Short-Term Resilient Supply but What About Long-term? The recent price weakness can be attributed to fears that high prices could trigger more mine supply to come online in China. Refined zinc supply remains resilient in the country. For the first two months, zinc refined output rose by near 4.5% compared to the same period of last year. However, supply might prove less resilient in the coming months. Some of China’s largest zinc smelters recently announced they will curtail roughly 540,000 mt of annualized capacity over an unspecified period of time. The announcement comes after China’s largest zinc smelter, Zhuzhou, started an indefinite maintenance period for 100,000 mt of smelting capacity earlier in March. In addition, according to a recent Reuters article, the second-largest zinc plant in North America has been running at 50% of normal operating levels due to a strike that started on February 12. The plant produces around 270,000 mt of zinc per year. Other analysts might be attributing the recent price weakness to slowing Chinese demand. That really hasn’t been the case. China’s GDP came at 6.9% in the first quarter, the fastest pace in almost two years, up from 6.8% growth in the previous quarter putting the country well ahead its goal of 6.5% annual GDP. Despite recent price weakness, zinc’s fundamentals remain strong. It seems way too early to call an end of zinc’s bull run. This month buyers might find a good opportunity to purchase zinc. You can check out our monthly metal buying outlook for monthly strategies on how to time your purchases. Coking coal has more than doubled in a matter of days as a cyclone caused disruptions to Australia’s coal exports. The impact was significant and several miners had to declare force majeure on their coal deliveries. It is estimated that shipments accounting for 50% of the global coking coal supply will be delayed and that Australia will need at least two months to regularize its coking coal exports after the natural disaster. 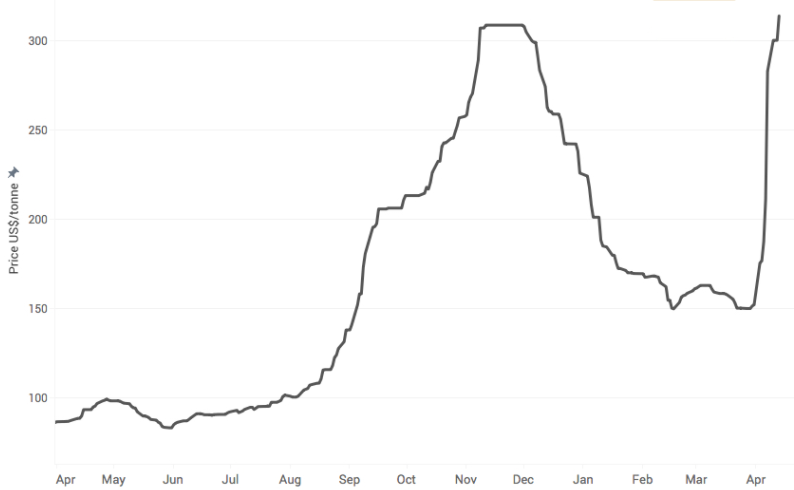 Australian coking coal’s free-on-board price in US dollars per metric ton. Source:mining.com. Coking coal prices rose sharply in the second half of last year when China reduced allowable work days at the country’s coal mines, which reduced output and tightened the global coking coal market. These events added fuel to rising steel prices in China. But a slump in coking coal prices since December added pressure to steel prices, especially in China since the country strongly depends on the commodity to make steel. Can Higher Coking Coal Prices Give a New Boost to Chinese Steel Prices? The Chinese cold-rolled coil price. Source: MetalMiner IndX. A recent CNBC article states that Australia is the world’s biggest coking coal exporter and therefore, China’s largest supplier. The recent disruptions are forcing China to look for alternative supplies such as Russia, Mongolia or Indonesia. In addition, China won’t import more coking from North Korea as a punishment to recent North Korean missile tests. Higher coking coal prices translate into higher input costs, particularly in China. Chinese steel prices set the floor for international steel prices, a topic that we discussed recently. Steel buyers should monitor the recent surge in coking coal prices closely since steelmakers will potentially pass on the increase to consumers, giving a boost to weakening steel prices in China. Since the beginning of March, steel prices in China have fallen sharply while prices in the U.S. have risen. That is simply not sustainable. These price divergences happen once in a while but they don’t last long. Over the next few weeks we’ll either see a rebound in Chinese prices or weakness in US steel prices. 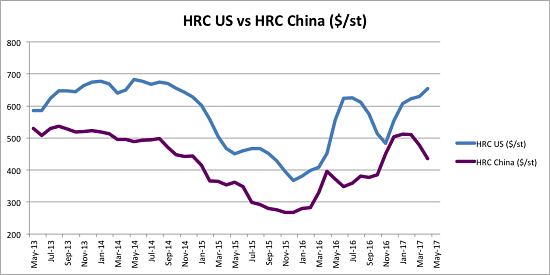 US HRC (in blue) vs. Chinese HRC (in purple). Source: MetalMiner IndX. Why do we say this? Well, China’s output accounts for more than 50% of world steel production. Currently, China isn’t a major exporter to the U.S., but it is the biggest exporter to the rest of the world. Therefore, Chinese prices put a floor under international steel prices. Since prices peaked in February, China’s hot-rolled coil prices have fallen nearly 15%. During the same period, U.S. HRC prices have risen nearly 8%. Interestingly, we saw a similar divergence last summer, when the U.S. imposed strong anti-dumping measures against imports. Such a wide international price arbitrage didn’t last long, as we predicted last year, this price arbitrage narrowed after that summer. 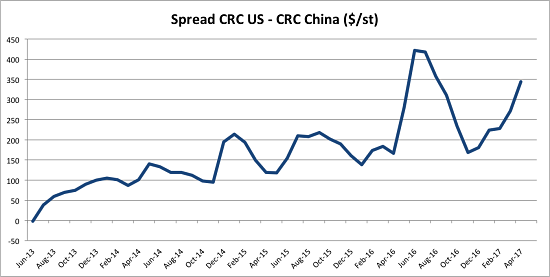 CRC price arbitrage US-China. Source:MetalMiner IndX. U.S. steel prices are now expensive again relative to Chinese prices. In the case of cold-rolled coil, the price spread stands now at $344 per metric ton, quite high compared to historical levels and not far from last summer’s peak of $420 per mt. A level that has proven unsustainable before. We continue to be long-term bullish on steel markets. However, buyers should closely monitor the recent divergence between Chinese and US prices. We should see a recovery in Chinese steel prices soon, otherwise US steel mills will have a hard time justifying further price hikes. Remember that we are in a global world and although US steel prices can temporarily move apart from Chinese prices, they will eventually move in tandem because otherwise, buyers will start looking to buy steel overseas.